Much of today's electric guitar centers on playing in a band. We learn the chords, the licks, the solos and sometimes a few of the lyrics. Seldom do we get a chance to play a song by ourselves from beginning to end without band mates or singing. 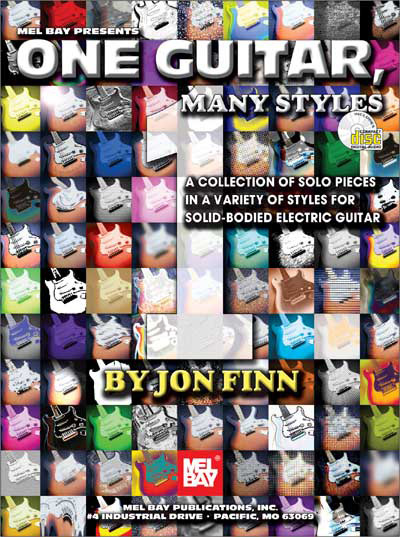 This new book by Berklee faculty and renowned recording artist Jon Finn is a collection of pieces in a variety of musical styles written for unaccompanied solo electric guitar. Techniques covered include pick-and-fingers (reminiscent of Chet Atkins), classical (adapted to electric guitar), jazz, blues, pop, two-handed tapping (like Jennifer Batten or Stanley Jordan) and more. The music is accurately and painstakingly transcribed to match the included recordings. The book also includes pictures and detailed information about playing each piece, both from a technical and artistic point of view. If you want to widen your musical horizons while building up repertoire that you can perform by yourself, this book is for you.